This research was funded by the National Institute for Transportation and Communities, or NITC, a program of TREC at Portland State University. Funding was also provided by the Oregon Department of Transportation. 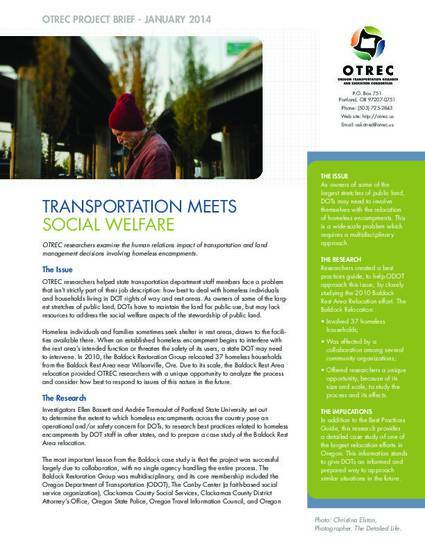 OTREC researchers helped state transportation department staff members face a problem that isn’t strictly part of their job description: how best to deal with homeless individuals and households living in DOT rights of way and rest areas. OTREC researchers examine the human relations impact of transportation and land management decisions involving homeless encampments. This is a summary of TREC research project OTREC-RR-12-14, which can be found online at: http://nitc.trec.pdx.edu/research/project/477. The final research report associated with this brief can be found at: http://archives.pdx.edu/ds/psu/16872.